A pocket watch is a watch that is made to be carried in a pocket, as opposed to a wristwatch which is strapped to the wrist, these were the most common type of watch from their development in the 16th century. Pocket watches generally have a chain attached to them to allow them to be secured to a waistcoat, lapel, or belt loop, and to prevent them from being dropped. The watch chains holding the watch are what we call an Albert style chain which has a hallmark stamped on every link. Chains were frequently decorated with a silver, gold or enamel pendant, often carrying the arms of some club or society, which by association also became known as a fob. The chains where often carrying practical gadgets such as a watch winding key, Vesta case or a cigar cutter, although usually in an overly decorated style. Also common are fasteners designed to be put through a buttonhole and worn in a jacket or waistcoat. Open - face pocket watch. The open-face pocket watch is self-explanatory; its design has no cover and the time can be read without having to remove any sort of case. This style of pocket watch was not at all popular in the eighteenth and nineteenth centuries, particularly as the porcelain faces used could be damaged very easily and needed the additional protection of a cover. This is why the full-hunter was developed: a pocket-watch complete with a cover that opened and closed on a hinge. The full-hunter pocket watch design often featured an ornately engraved outer casing with initials or even a picture or photograph displayed on the inner. Time-keeping, however, could become quite a hassle when the cover had to be opened every time the owner wanted to check the time, and this is why the half-hunter was invented. The half-hunter pocket-watch featured a cover that included a crystal or hole that allowed the owner to see the hands of the watch without having to open it. The Double Hunter pocket-watch has many of the same features as the Full Hunter pocket watch, with the front face of the pocket watch covered with a protective lid, but the difference with a double hunter pocket watch is that there is also a lid which opens on the back of the pocket watch, which is designed so that the mechanical movements of the pocket watch can be viewed, it also makes the pocket watch easy to stand on its own so that the time can easily be read, On Double Hunter pocket watches, the '12' would be located just below the stem of the pocket watch, which would mean when the watch is sitting on its own, the time would be facing the correct way. Watches of any quality will be jewelled. A jewel in a mechanical watch is a small shaped piece of a hard mineral. Ruby and sapphire are most common, although diamond, garnet, and even glass are often seen. Starting in the early 20th century, synthetic jewels were almost universally used. Before that time, low grade natural jewels which were unsuitable as gemstones were used. In either case, the jewels have virtually no monetary value. 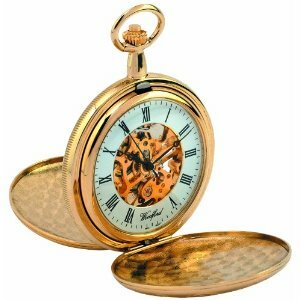 The traditional style for wearing a pocket watch is to wear the watch on an Albert chain. Albert chains are available in the Single Albert or Double Albert style. This fashion became popular in the 1900s in honour of Prince Albert of England. Single Albert watch chains fasten to the middle buttonhole of the vest and usually have a fob drop of some sort hanging down from the chain end. At the other end of the chain, the watch rests in the left vest pocket. The Double Albert chain is longer and fastens to the vest in the middle of the chain. One end of the chain holds a watch while the opposite end of chain can carry a number of different items. The heavy gold chain makes an impressive appearance looping from centre vest to pockets on both sides. Albert chains have a hallmark stamped on every link and are mostly made from solid 9ct gold. You may also come across a graduated Albert style chain which starts off with smaller links and gradually they get bigger and then they get smaller again.